Now, a variety of screens – long and wide and square, large and small, composed of grains, composed of pixels – compete for our attention without any arguments about hegemony. Not only does our concept of ‘film history’ need to be reconceptualised in light of these changes in technology, but our assumptions about ‘spectatorship’ have lost their theoretical pinions as screens have changed, as have our relations to them (Friedberg 2000, 450). It is clear that, more than a decade later, the birth of new kinds of screens continues at pace. Equally, film studies is beginning to catch up, with scholars such as Henry Jenkins, Barbara Klinger, Janet Harbord and Francesco Casetti turning their attention to cinema in the post-cinema age. Despite this late surge of attention, Friedberg’s closing question remains: what kinds of new relations have these new screens produced? And more specifically, how are our assumptions about spectatorship: what it includes and excludes, what is has been, is now and could be, challenged? 3) through new objects of study: DVD extra menus for children, looped gallery films and brief cell phone movies, interactive cinema formats, water-themed moving images that are part of a wellness itinerary, YouTube clips and cinema-going (and knowing) as inter-twined with everyday life. Moving to a more detailed description of the foci of our special issue—i.e., the exploration of the different screen attachments that originate outside the movie theatre—we begin by acknowledging Francesco Casetti’s leading work on cinema’s “relocations” and his series of provocative essays (Casetti, 2008a, 2009, 2011a, 2011b). While film scholarship deepens its reflection on what the new digital revolution and its multiple windows are adding or taking away from cinema as we have known it for over a century, Casetti urges us to look backwards and not just forwards (Casetti, 2008b). He proposes that in order to find out what really happens to cinema once it leaves the movie theatre or the “Motherland” (Casetti, 2011a) that has been its predominant location, we should refocus on the filmic experience itself (Casetti, 2009). In so doing we might understand how cinema’s unique identity separates it from other media experiences (Casetti, 2011b). In the essay he has contributed to this special issue, Francesco Casetti goes a step further in his analysis of cinema’s relocation both theoretically and historically and directly addresses the main issues involved in the theorization of what we have referred to as screen attachments. He explains spectators’ new attachments to cinema’s relocated screens and explores the breaking of the “original” unity of the filmic experience following two main “paths”. The first path he re-traces is based on delivery and the second on setting. According to Casetti, in the first path, we recognize cinema because what we watch is still the film object (narrative cinema) that we used to watch in the movie theatre, even though it is delivered on other screens that, unlike in the movie theatre, presuppose interrupted and fragmented viewing. In the second path, we recognize cinema because of how we are watching, that is in a setting that mimics the movie theatre, even if the film object (narrative cinema) may have been substituted for other objects. In the two paths for relocation cinema is both “faithfully” reconstructed and “treacherously” transformed. Following Casetti’s lead, all the essays included for this special issue of Screening the Past deal with either new filmic objects or cinematic (re)locations, and sometimes both; they therefore offer different perspectives on how spectatorship, or the activities of viewing, are both recognized and transformed a decade after Friedberg’s opening observations. In her essay Karin Beeler argues that scholars have yet to account for the different ways in which children engage with DVDs, and in particular their use of DVD extras. She borrows from play theory so as to explore the structure of children’s viewing practices against a theoretical backdrop that combines Henry Jenkins’ work on ‘participatory culture’ and Barbara Klinger’s study of DVD home viewing with Casetti’s conceptualization of the filmic experience. Beeler makes several key points: first she observes that the platforms through which children originally encounter a particular film will necessarily shape their experience of it. DVDs automatically involve the possibility of an expansion of the filmic experience, as children can interfere with the film (stopping, replaying and rewinding and fast forwarding) and interact through the DVD extras. Second, as Beeler’s case studies make clear, extras are explicitly designed to augment the viewing pleasure: driving children back to the film to view it again once they have dallied with a particular character or figure from the original film and testing the depth of their knowledge of plot and characters (and thereby encouraging repeat viewing). Beeler’s third key point involves the recognition that while many of the ‘actions’ detailed so far might as easily be employed by an adult viewer, children’s viewing can be distinguished through the centrality of play and repetition to the activities of viewing. Beeler employs two case studies to explore her key points: Lion King 1 ½ (2004) and Tim Burtons’ Charlie and the Chocolate Factory (2005). From Beeler’s focus on children viewing DVDs at home, our essay (Fowler and Voci) shifts content and locations. Nevertheless, our intervention into theories of spectatorship is the same, as we extend understandings of film viewing from the ‘act’ of watching towards ‘activities’ that include moments of intense engagement and productive dis-engagement. Like Beeler also, we argue for a ‘relocation’ of film theory’s gaze, beyond the movie theatre, though our new locations are the art gallery and the portable screen of the online and on-the-phone media that inhabit both public and private spaces. With relocation comes the recognition that the attachments forged between viewers and films in galleries and/or on portable screens are sometimes cinematic in nature. In addition to Casetti’s delineation of the filmic and cinematic as pertaining to the object and the location for cinema, we propose that cinematic screens can be distinguished from the many other screens that surround us, because they channel movement in significant ways: first, in terms of their references to cinema or ‘kino’ as movement; second, through the emotional (‘emovere’) attachments that they invite; and third, through the moments (‘movere’) of engagement through which they order our viewing. Our essay focuses on an exploration of brief encounters between viewers and screens, that is, short moments of engagement that promise a particular kind of intense attachment that originate from moving in and out of the cinematic experience. The notion of the moment offers a way of understanding how viewing outside the movie theatre might still be cinematic, despite the different temporal formations and spatial locations. Ultimately we search for a model for these other cinematic screens, considering along the way the dominant introverted and extroverted models for spectators, audiences, fans and users. What we find in our search is the possibility that other cinematic screens, other locations and new objects of study might be bringing about a new order, or, to be more precise, a dis-order that challenges the dominant order that the institution of cinema has developed over more than a century. While Beeler’s essay adds theories of play to the theoretical field of spectatorship and our essay develops notions of the moment to explain the intense attachments between viewers and other cinematic screens, Jenna Ng takes up theorisations of probability and contingency and explores chance as a mode of engagement for viewing online interactive cinema. Accordingly, each of these essays broadens the language that has been used to describe how spectators view, engage with, take pleasure from and make use of moving images. More specifically, Ng’s essay takes up work in film and media studies on interactivity and interactive cinema. Much of the literature on interactive cinema so far discusses its effects on narrative. Yet, Ng argues, interactive cinema also presents intriguing questions in terms of the spectator’s filmic engagement. By enabling the choice of one plot development over another, interactive cinema produces different attachments with cinema and brings a new challenge to the conceptualization of the active spectator. Her essay explores these different attachments by examining the interaction with two interactive works: Kineautomat (as screened and “staged” in a hall) and Sufferrosa (as shown online). Ng’s first argument is that a new attachment is formed when the spectator engages with a film text that is not just screened but also “staged” and therefore “results in a mode of film engagement akin to gaming that incorporates limited agency within a controlled situation”. Furthermore (and this is Ng’s second argument), “watching online interactive films creates a unique viewing experience of chance, whose significance lies not so much in the images as in the motivated yet random movements of the computer mouse”. With Adriano D’Aloia’s essay we shift locations once again, from the home, art spaces and the Internet to health spas. 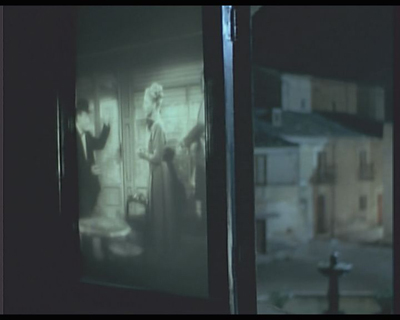 The example of moving image installations in Italian Spa’s is used to provide an original examination of what Casetti has called the relocated filmic experience. Just as Ng re-examined interactivity, so D’Aloia re-visits scholarly work on immersion and, to a lesser extent, absorption. The moving image installations he explores act as a hinge that joins the classical viewing experience in a movie theatre with the relocated experience outside of that familiar space. More importantly, D’Aloia argues, “the spa moving image experience helps us to reframe both the theatrical and relocated dimensions of the contemporary film experience”. In his essay the relationship between viewers and screens becomes one that is multi-sensorial and also part of a ‘wellness itinerary’. Spa installations are used to interrogate the well accepted application of notions of immersion and absorption to describe how viewers are enveloped, and involved in, engage with and become attached to cinematic moving images. D’Aloia’s essay asks important questions that contribute to studies of the attractions of moving images once they step outside of the movie theatre. In his case study, consisting of installations and projections at Termemilano spa, Milan, he traces the ways in which an annex to the film experience is offered, as all our senses are engaged “through the use of interfaces that combine simulated stereophonic sound, tactile and haptic impressions with thermoreceptive and even kinaesthetic sensations”. In one sense D’Aloia’s examination of a water-based screen experience propels an examination of the roots of the application of the terms immersion and absorption. For visitors to the spa are literally immersed in water before encountering moving images projected on walls and ceilings that show abstract and real underwater impressions. Following these water-based therapies, visitors can undertake a water-based moving image experience either in rooms where relaxing, abstract underwater images are projected on walls and/or ceilings, or in the magic dome in which a 360 degree geodesic structure containing images and sounds envelops the visitors. For D’Aloia, acoustic space supports “a sort of hydro-audio-visual massage” that is set off by the virtual and literal ‘enwatering’ of visitors. Finally, D’Aloia observes that spa moving image experiences might be seen as responses to the loss of immersion that accompanies the exit from the movie theatre. Yet it is not as if we are once again absorbed in the film, involved with characters and forgetting ourselves; instead, the spa-going experience offers a “new kind of embodied auto-empathy based on ‘bodily immersion’ ”. The essays thus far in this special issue supplement and re-negotiate pre-existing theories of spectatorship. Eu Jin Chua’s essay also enters into dialogue with founding scholarship, specifically that of Vivian Sobchack on Quicktime movies, which he takes and expands into the present day. By focusing on YouTube as an alternative screening space, ‘Chua’ identifies a “minoritarian digital poetics” that he compares and contrasts with the dominant tendencies of digital technology. For Chua, such poetics is characterized by “pensive reverie, hypermnesic longing, interiorism, embeddedness, fragmentation, reparative patchworking, in-built obsolescence, and frayed imperfection”. By recognizing and theorizing a minoritarian digital poetics of film within the fragmented and impure context of Youtube, he proposes that “internet spectatorship is an extraordinary combination of engagement and distraction” and that intense aesthetic engagements with films can and do still take place when watching videos on Youtube. With Vijay Devadas’ essay, that closes this special issue, we complete our exploration of a few of the many spaces for the relocation of cinematic screens, settling on a case study that examines the ways in which cinema, the screen, is implicated within a specific sociality, and intertwines and is entangled with the everyday lives of South Asian migrant workers. Once again this essay broadens the language that has been used to describe how spectators view, engage with, take pleasure from and make use of moving images. More importantly, Devadas offers the notion of screen encounters to describe not simply “what is projected on screen and other forms of experiences” and “what is experienced inside the cinema hall and everyday spaces and ways of being of a specific sociality”, but also “the multiple, complex relationships between scholars and their subjects”. Devadas’ essay draws on field research on Tamil migrant workers in Singapore and their encounters with cinema, or to be more precise three screen encounters in particular which he describes as: the tactical undoing of urban space, the politics of cultural consumption and transnational labour regimes. Drawing on the work of Janet Harbord, De Certeau, Foucault, Deleuze and Guattari, and recent debates in screen studies, Devadas contends that we need to forge a new cartography to conceive of the screen encounter, one that rethinks the screen experience beyond the screen itself, as an assemblage that endlessly mutates, spreads and connects with other spaces, peoples, structures, institutions, modalities of power and resistance, in sometimes unattributable ways. Devadas’s interrogation of this assembled notion of encounters (not just with the screen but with what surrounds it) from the specific perspective of the Tamil migrants in Singapore therefore adds crucial dimensions to the attachments analysed in this issue: the historical, social and political contexts in which we analyse our relations with screens. The seven essays that contribute to this special issue all engage in the exploration of the different screen attachments that originate outside the movie theatre. For Casetti, by recognising the two paths of relocation we can understand how cinema’s unique identity separates it from other media experiences. For Beeler’s study of activities of play in childrens’ use of DVD extras and for our essay on moments of engagement in gallery films and portable movies, the ‘act of viewing’ is extended towards ‘activities of viewing’ without losing the centrality of seeing. For Ng and D’Aloia’s essays, key critical language—interactivity, immersion and absorption—are measured against new objects of study and thereby interrogated. Finally, in the contributions offered by Chua and Devadas, assumptions about the totalizing impulses of dominant technology (in the former) and the totalizing impulses of scholarship (in the latter) are examined. For Chua what is required from the discipline is recognition that the minor qualities and effects he finds in some YouTube content have value. Finally, for Devadas the notion of screen encounters facilitates the conception of cinema as a complex assemblage of attachments, encounters, connections and dispositions. To return to our starting point, one of the key “assumptions about spectatorship” to which Friedberg refers has been that the spectator-film relationship happens in a place called the cinema. The essays in this special issue prove that this is no longer the case; they act as a prompt for scholars to look elsewhere for the spectator-film relationship and they also offer evidence of what is to be gained by doing so. Friedberg, A., 2000. The end of cinema: multimedia and technological change. In: C., Gledhill and L. Williams, Reinventing film studies London: Arnold, 2000, pp. 438-452. Casetti, F., 2008a. Eye of the century: film, experience, modernity. New York: Columbia University Press. Casetti, F., 2008b. The Last supper in Piazza della Scala. Cinèma & Cie, 11, pp. 7-14. Casetti, F., 2009. The Filmic experience. Screen, 50(1), pp. 56-66. Casetti, F., 2011a. Back to the motherland: the film theatre in the postmedia age. Screen, 52(1), 1-12. Casetti, F., 2011b. I media nella condizione post-mediale. In: R. Diodato & A. Somaini eds. Estetica dei media e della comunicazione. Bologna: il Mulino. This special issue of Screening the Past also owes a debt to the Screen Cultures conference (<http://www.otago.ac.nz/languagescultures/screencultures.html>) and to the intellectual generosity of Professor Francesco Casetti. Special thanks to our research assistant, Owain Gwynne, for his help in developing an excellent preliminary bibliography and to all the referees who have blind reviewed the essays, so promptly and thoughtfully’.